Gold fell Wednesday for the eighth straight day. However, silver, platinum, oil and U.S. stocks advanced. For the daily numbers, New York gold futures declined 0.8 percent while silver and platinum gained 1.6 percent and 0.8 percent, respectively. In U.S. stocks, the Dow jumped 2.2 percent, the S&P rose 2.4 percent and the Nasdaq climbed 2.5 percent. Crude-oil for April delivery surged $3.73, or 9.0 percent, to close at $45.38 a barrel. The average price for regular unleaded gasoline was unchanged at $1.933 a gallon, according to AAA. March silver rose 20.5 cents to close to $12.90 an ounce. 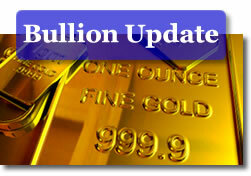 Gold for April delivery declined $6.90 to end at $906.70 an ounce. "A further dissipation of safe-haven investment demand brought gold prices to the $900 (and under) level today," wrote Jon Nadler, senior analyst at Kitco Bullion Dealers. "A global rally in equity markets turned at least some would-be gold buyers into actual stock buyers, following China’s unveiling of another Great Wall (of Money) intended to stem the slippage in its economy." In spot trading, the London afternoon gold-fixing price — a benchmark for gold traded directly between big institutions — stood at $908.50 an ounce. London silver and platinum were at $12.87 and $1,039.00, respectively. In collector gold coin news, the US Mint lowered First Spouse Coin prices by $25. The price for the Ultra High Relief Double Eagle was reduced by $50.